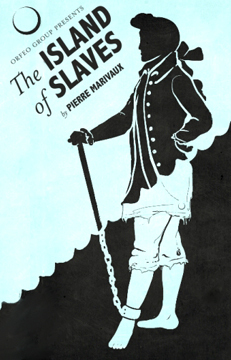 Orfeo Presents "The Island of Slaves"
Award-winning theater company Orfeo Group wants you to know that they've braving new theatrical waters with their upcoming production of Pierre Marivaux's "The Island of Slaves," translated and adapted by Neil Bartlett. Directed by Chicago-based Kathryn Walsh, the production runs February 11 - March 6. Following on their success of last summer’s "The Complete Works of William Shakespeare (Abridged)," the company is temporarily residing at the Plaza Theatre at the Boston Center for the Arts. A mix of comedy and cruelty, "The Island of Slaves" depicts the plight of four people, the sole survivors of a shipwreck, who wash up on a desert island. Two of them are masters, and two of them are servants; all four are about to discover what life feels like when the boot is on the other foot. Orfeo Group aims to produce not only plays, but experiences for its audiences to connect with as well. Thanks to a recent seating upgrade, new configurations are possible for the first time in the Plaza Theatre. Of their new home at the BCA, Orfeo Group's Caleb Magoon commented, "We want people to enter the Plaza space and become both immersed in and absorbed by the world of 'The Island of Slaves.'" In addition to their innovative use of a traditional theater space, Orfeo Group is introducing a unique ticket pricing structure for this production. Finding that their audiences tend to wait until the final weekend to see certain productions, Orfeo Group is giving audiences added incentive to “buy early.” During the first weekend, February 11 -14, all five performances will be presented free of charge. The following week, February 17 -21 will feature $18 tickets; subsequent weeks are $25 and $30, respectively. The company is also excited to have a significant number of artists new to Orfeo Group in "The Island of Slaves." Orfeo core members Risher Reddick and Daniel Berger-Jones will head a cast that includes Orfeo newcomers Amanda J. Collins, Jared Craig and Hannah Husband.